Happy Friday!!! 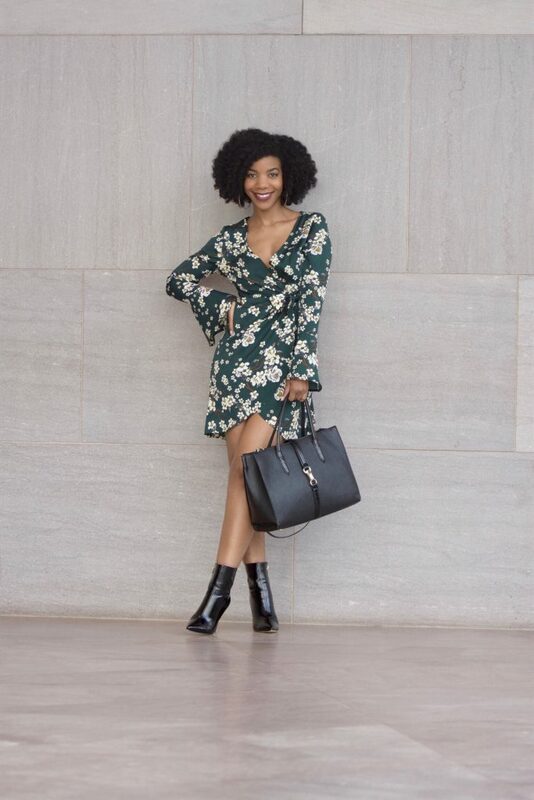 The first official day of spring isn’t until next Tuesday (and it’s supposed to snow here in DC on that day), but I’m bringing y’all spring vibes today on the blog with this super cute floral wrap dress SheIn sent me to review. When I first saw this dress, I had to have it! It gave me happy floral spring vibes in contrast to this dreary winter weather that is not making me happy, lol. The material is nice and lightweight. The dress runs true to size, and I’m wearing an XS. I always look at the reviews on SheIn to figure out the quality of an item, and which size I should get. My first thought was to pair OTK boots and a leather moto jacket with this dress since it’s still so cold outside. But, I decided to go with these short booties instead because I’m protesting the rest of winter, lol. And they give the dress a little more edge. I had my jacket with me, and it looked really cute, I just forgot to wear it for these pics. In warmer weather, I’d wear it with a pair of strappy heels. I don’t know what it is about having a nice green tree as my background, but it always gives me perfect lighting, lol! Thanks for reading! Will you be rocking florals this spring? Let me know below! You’re looking like a fly mamacita! Beautiful dress!! You have inspired me to give them a try!! Thanks Brittany! You def should! As always, you are rocking this look. Thanks for sharing! This is such a cute dress. I have always wondered about SheIn clothing, now I know what to expect. The dress will still look great with a jacket. I love this dress! The cut and pattern is flattering and I love how your rocked it out with the short booties. And off topic, but from one curly girl to the next I have to say that I Love your hair! Thanks Olena, I appreciate that curly girl! I WANT this dress. I am checking right now to see if they have it in my size. Your booties are cute too. Thanks Kim! Hope you were able to snag it! To cute. I love the whole look. I have to much booty for that dress but I always want to wear stuff like this. Thanks Monique! A longer version would look fab on you! You just gave me life with this entire look!. From the hair to the booties everything is FIRE! 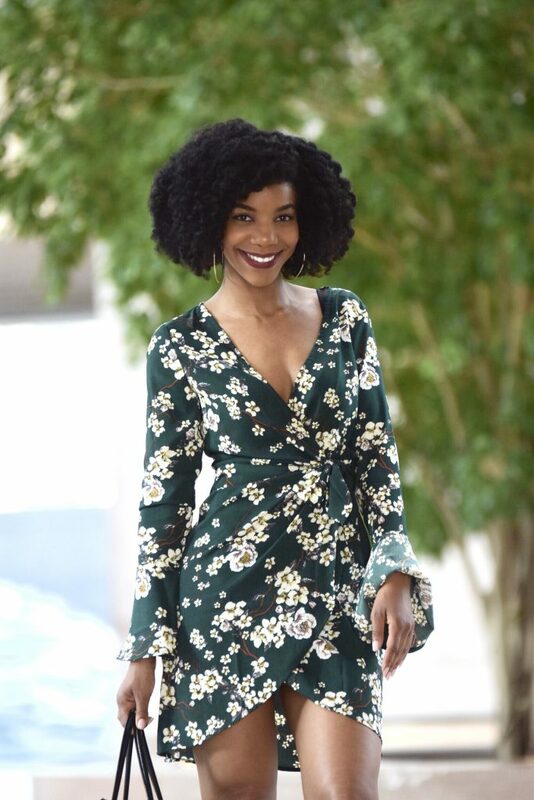 I love a good wrap dress and I myself wore a printed green wrap dress on the blog, lately. 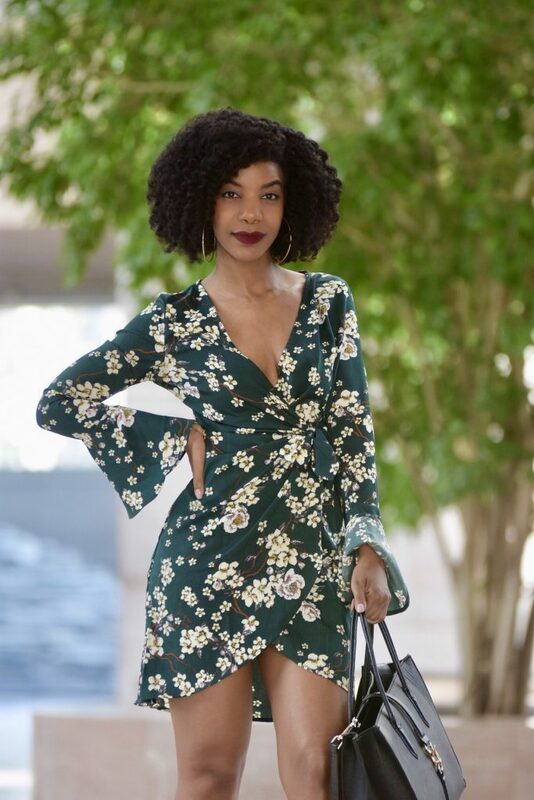 I cannot believe your pretty dress is from SheIn and that is true to size. Your legs look a mile long. Great idea pairing it with edgy booties. I am so freaking ready for spring. It is one of my favorite seasons for sure. I love a dress, they make me feel so flirty. Spring is definitely in the air with that dress. I love the green tree backdrop but it isn’t even necessary as you are in full bloom of style while rocking it. I am excited that it is wrap dress season! 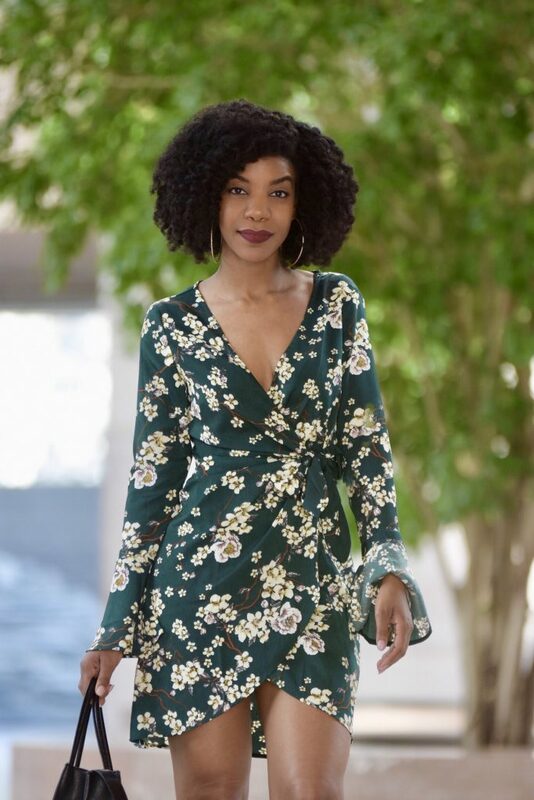 I love the florals and I want to get me some wrap dresses now! I am super excited for wrap dress season! I love florals, and bright colors for Spring!